Play for a cause! 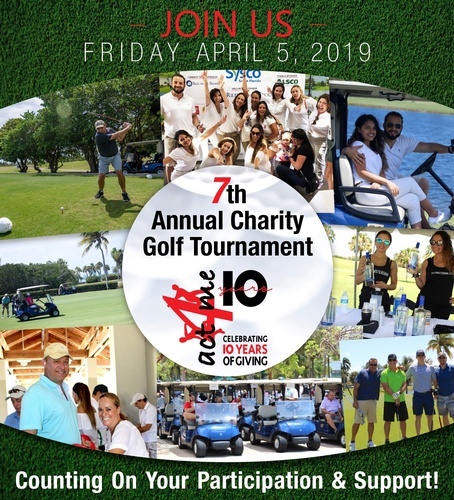 Join Act4me for a rewarding day at the Championship Crandon Golf Course. Tournament Fee Includes: OPEN BAR | Green Fee | Cart | Complimentary Snacks, Beverages and Liquor | Goodie Bags | Prizes and Contests | Awards and Reception Dinner After Tournament. Trophies by Artist Benedicte Blanc Fontenille for 1st, 2nd, 3rd place. Prizes for Closest to the Pin, Longest Drive and Most Accurate or Straightest Drive. Hole in One Wins $30,000.00! Sponsorships and volunteer opportunities are available. Maida Berberian-Bignon | maida@act4me.org | 786.390.1172 (Players and Sponsorships) for additional information.